Today is a little bit different type of post. You might remember in the past I’ve gotten these Influenster VoxBoxes ( like this and this one). If you don’t know what Influenster is it’s basically a site where you can review almost anything. Based on what you’re interested in and what you review or answer questions on you earn points, the more points you have the more likely you are to be an “influenster” and receive boxes like mine! 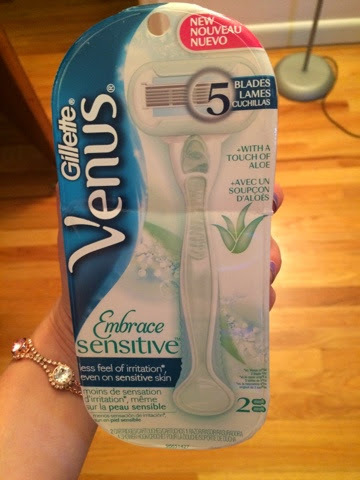 This time I received the Gillette Venus Secret Embrace Sensitive razor, and here’s what I think. First of all, let me just say that my leg hair is blonde and thin, so I personally never had a problem with any razor, but when I shave quickly I always get the dreaded razor burn, and that’s way worse. 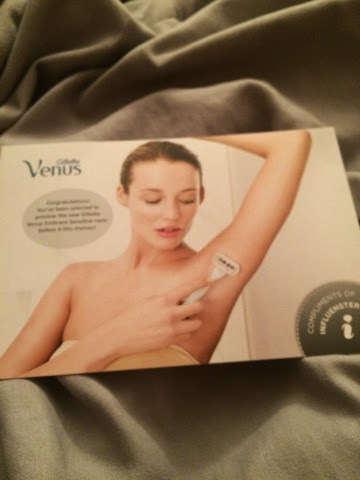 Next, I shaved my underarms, and I made sure I worked slowly cause there is nothing more painful than a scratch on your armpit, I shaved on Saturday and the hair actually hasn’t grown back too much, I don’t know if that has anything to do with the razor but I just thought I would let you know. Finally, I shaved the ever dreaded bikini area. I usually shave that area with some acne wash, the salicylic acid works to get rid of the redness that can occur. But I shaved without it. It definitely made my skin feel smooth, but my bikini area still suffered some redness. I’m not sure if this would have happened if I used the salicylic acid so I’ll try it an update ! Overall, I think this razor is great, it’s sharp, light, and the glide enhancers have aloe in it to help soothe skin. I would definitely recommend this razor if you are in the market for one!